Figure 2. 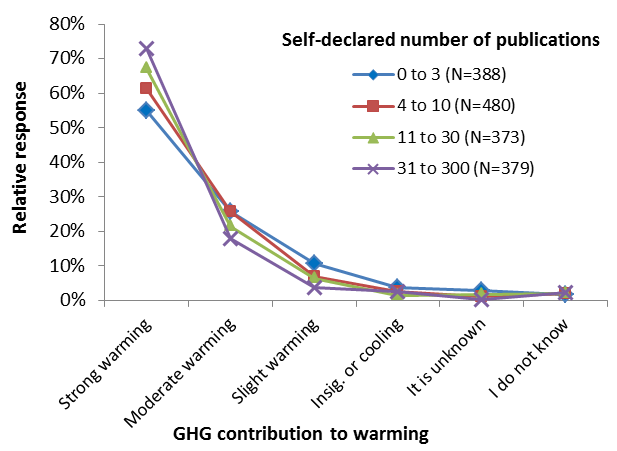 The more publications the respondents report to have written, the more they agree with greenhouse gases being the main contributor to global warming (red bars). 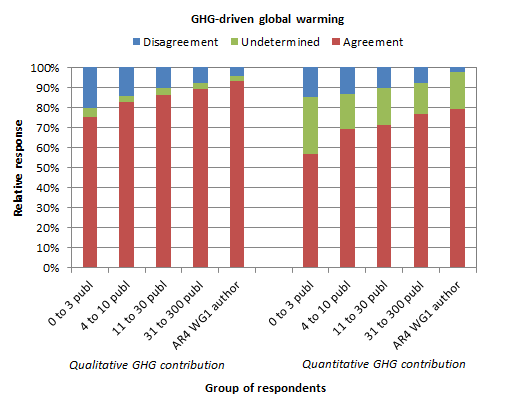 IPCC AR4 authors report the most agreement with GHG-driven global warming. Results are based on two different questions, one about the qualitative contribution of GHG (Q3) and one about the quantitative contribution of GHG (Q1).The latter question resulted in more “undetermined” answers (unknown, I don’t know, or other), presumably because it was more difficult to answer. Hence the percentage of consensus can best be compared by excluding these “undetermined” answers. Responses are shown as a percentage of the number of respondents in each subgroup. The concept of ‘consensus’ has been discussed a lot lately. Whereas the presence of widespread agreement is obviously not proof of a theory being correct, it can’t be dismissed as irrelevant either: As the evidence accumulates and keeps pointing in the same general direction, the experts’ opinion will converge to reflect that, i.e. a consensus emerges. A theory either rises to the level of consensus or it is abandoned, though it may take considerable time for the scientific community to accept a theory, and even longer for the public at large. By phrasing Question 1 analogously to the well-known attribution statement of AR4 we found something peculiar: Respondents who were more aware of the cooling effect of aerosols in greater numbers assessed the greenhouse gas contribution to recent warming to be larger than the observed warming (consistent with the IPCC assessments). We concluded that the AR4 attribution statement may lead people to underestimate the isolated greenhouse gas contribution. The comparable AR5 statement is an improvement in this respect. Respondents were also asked about the frequency of being featured in the media regarding their views on climate change. Respondents who thought climate sensitivity was low (less than 1.75 degrees C per doubling of CO2) reported the most frequent media coverage. Likewise, those who thought greenhouse gases had only made an insignificant contribution to observed warming reported the most frequent media coverage. This shows that contrarian opinions are amplified in the media in relation to their prevalence in the scientific community. This is related to what is sometime referred to as “false balance” in media reporting and may partly explain the divergence between public and scientific opinion regarding climate change (the so-called “consensus gap”). Figure 3. 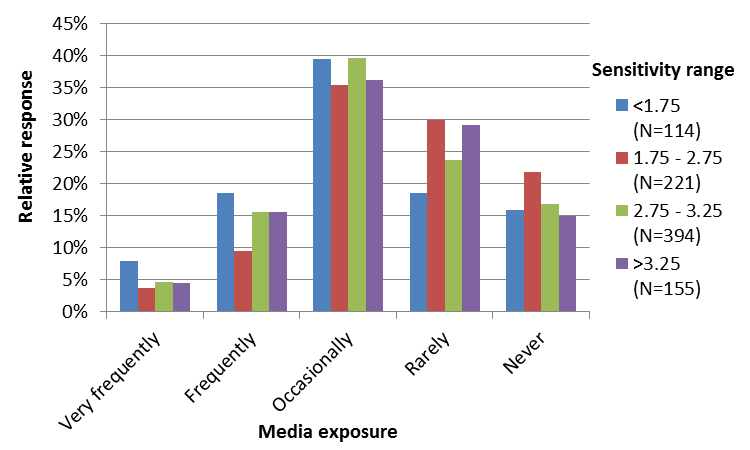 The most frequent media coverage is reported by respondents who estimated climate sensitivity to be lowest (<1.75 degrees for a doubling of CO2 concentration). Respondents are grouped according to their estimate of climate sensitivity (colored bars). Responses are shown as a percentage of the number of people (N) in each climate sensitivity range. Respondents were selected based on a few criteria: Having authored articles with the key words ‘global warming’ and/or ‘global climate change’, covering the 1991–2011 period via the Web of Science. This is the same database used by Cook et al in their recent ERL study (PS: John Cook is co-author on this current study as well). Respondents were also selected based on inclusion in the climate scientist database assembled by Jim Prall, as well as by surveying the recent climate science literature. Prall’s database includes signatories of public statements disapproving of mainstream climate science. They were included in our survey to ensure that the main criticisms of climate science would be included. This last group amounts to less than 5% of the total number of respondents, about half of whom only published in the gray literature on climate change. Detailed questions were posed about a variety of physical climate science issues, which are discussed in the public debate about climate change. Answer options reflected a variety of viewpoints, all of which were phrased as specific and neutral as possible. Before executing the survey, questions and answers (pdf) were reviewed by physical and social scientists and climate change public commentators with a wide range of opinions (see acknowledgements for a list of names), to minimize the chance of bias. Comments on the survey by respondents varied: some said it was slanted towards the ‘alarmist’ side (“Obviously these questions were posed by warmists”), but more respondents commented that they thought it was slanted towards the ‘skeptical’ side (“I suspect this survey comes from the denial lobby”). Reference: Bart Verheggen, Bart Strengers, John Cook, Rob van Dorland, Kees Vringer, Jeroen Peters, Hans Visser, and Leo Meyer, Scientists’ Views about Attribution of Global Warming, Environmental Science and Technology, 2014. DOI: 10.1021/es501998e. Supporting Information available here. The article is open access. An FAQ for this article is here. A Dutch version of this blogpost is here. This entry was posted on August 11, 2014 at 14:14 and is filed under Climate Science Survey, Consensus, English, Media, Skeptics. You can follow any responses to this entry through the RSS 2.0 feed. You can skip to the end and leave a response. Pinging is currently not allowed. Will examine the paper in full when I can print it. The use of Cook et al’s data as source. Cook’s search terms: ‘global warming’ and ‘global climate change’, while appearing intuitive, does not fetch relevant papers from Web of Science. Most of Cook et al’s papers are retrieved by the search phrase ‘global warming’. The authors failed to reveal this bit of information in their paper. ‘Global warming’ is a phrase used by workers in the climate impacts and mitigation fields. It stands to reason their database of email addresses is constituted predominantly by researchers working in these areas as the addresses were sourced from the papers. Scientists and workers in these areas are not suitable targets to determine in-depth views on orthodox IPCC climate science positions on attribution. Additionally, they are unlikely to disagree with IPCC positions. It would violate assumptions of their own fields of expertise. Jim Prall has an extensive list of scientists publishing in climate fields. Prall’s list, however, includes scientists associated with the IPCC reports themselves. For instance, the list included 916 scientists who were contributors to the IPCC AR4 report. Interviewing scientists who were authors of the IPCC reports on whether they agree with IPCC formulations is circular. Dennis and Bray have previously demonstrated that IPCC authors are likely to agree with summary conclusions of reports they were authors on. The real interesting remaining bit in the data is the fraction of respondents that were not in Cook’s ‘global warming’ retrieved authors, or not IPCC AR4 or AR5 authors. Closer examination of the paper’s data might provide useful information, on *how big this fraction really is*. Or, if the authors pursue the same data practices as one of the present papers’ authors, John Cook, we might never learn the answer to such questions. Did any of the 1800 explain the Pause adequately? Commenter Shub’s second complaint makes no sense. The study results isn’t “people who agree with a committee”. It’s “people who agree about a feature of the universe”. It’s totally appropriate to include people who have previously said they agree. Wtf, Shub? sunshinehours1, anyone can explain the “pause”. You have to zoom in perfectly and ignore data to even think it exists. Zoom out and don’t cherry-pick data. The problem with climate science is that too many citizens think the amount of time a sit-com last is an appropriate amount of time to judge trends of an entire planet. I guess, by septics standards, Bart, you shoud’ve sent the questionaire to the Oregon Petition signatories. 30 thousand highly qualified septic scientists opposing human-caused global warming. 30k is bigger then 1.8k, no? Shub wins. Any study that carries John Cooks name will never be accepted by septics. That in itself is really interesting. Oh, and a third, that is not so much a problem as a warning: beware of Tol and his many gremlins on Twitter. Well, clearly, this study was flawed because I don’t remember receiving a survey! And I’m even on Prall’s list (top 1500). In any case, thank you for doing this study. I personally think that the Cook & Oreskes papers are examples of results that are correct (e.g., that the majority of scientists with climate expertise believe that human-induced increased GHG levels have contributed the majority of recent observed warming), but methodologies that are imperfect (e.g., a large number of the abstracts that contribute to the “97%” number from Cook et al. don’t really state anything regarding the attribution question). Not only that, but I found the question regarding the quantitative percentage of the human contribution interesting, because I’ve long thought that the best estimate was >100% for GHG contributions to warming (I even think it is as likely as not that GHG+aerosols contribute >100% of recent warming). Chad … Chad … Chad. The Pause exists. Denying it exists is so sad. Anderegg et al, of which Jim Prall was a co-author, purported to examine expertise level in researchers who agreed or disagreed with ‘the consensus’. The ‘consensus’ opinion was defined as the IPCC AR4 attribution statement. 916 authors of the IPCC AR4 WG1 were included in the study on the basis of their agreeing with the consensus opinion, i.e., the very statement chosen by the authors to represent it! The circularly originated data has now become the source of a second study, namely the present one. Nice. And quantifying “The most frequent media coverage is reported by respondents who estimated climate sensitivity to be lowest” is cute. often singular] unanimous judgment or belief that a group comes to after discussion: The consensus was that they should meet twice a month. Anyway, of course, “consensus” is a political term, not scientific. I can easily counter with another definition (e.g. Merriam-Webster “a general agreement about something”). The point is that in the paper is clearly defined what is meant with consensus. Also in the whole broader discussion consensus refers to broad agreement, not necessarily unanimity. There isn’t even unanimity about the near-sphericity (sp?) of the earth, so the concept of strict unanimity in the context of scientific opinion is fairly meaningless. You didn’t mention what was to me the most interesting and surprising result of the study: The majority of respondents who thought that the equilibrium climate sensitivity is at the bottom of the IPCC range. You only mentioned the sensitivity as regards a much more tenuous side point: the expertise of the various opinions on it – without telling us what they said. I don’t mean to be uncharitable, but this most interesting result of your study is also the one that skeptics will like – and that’s the one you left out. Note also that the famous “97%” figure is not supported by your study. There is a strong consensus, but there are dissenters too, as sensible people knew all along. The study looks really nice, by the way. Obviously I’m not in a position to have looked at the data in detail, but the questions look good and you got a good response rate from a nice sample of scientists. I should correct what I said: it wasn’t a majority who said that the sensitivity is at the bottom of the IPCC range. However, the lower numbers were a very large minority (~350 compared to 450 who chose the middle of the IPCC range, and ~125 chose the higher values). values.” I’m not sure this is an appropriate comparison: I think there is a difference between a distribution of everyone’s best guess to a value, and the distribution of that value. For example, harkening back to my days of roleplaying games, say I roll 3 six sided dice behind a screen. I ask people, “what’s the most likely sum of the 3 dice?” I should get, assuming a mathematically literate audience, either 10 or 11. But the actual distribution runs from 3 to 18. So it would have been interesting to ask in addition to what the best guess of CS was, what the 95% distribution was. And I think what you’d get is a large number of long-right-tailed distributions, even if more of them have means clustered between 2 and 3. And it would be interesting to then average those distributions and see the characteristics of this new pdf. > Cook’s search terms: ‘global warming’ and ‘global climate change’, while appearing intuitive, does not fetch relevant papers from Web of Science. What search terms would you use, Shub, and which operational definition of relevance do you have in mind? Agreement on a subject does not indicate the agreement has reached to correct conclusion. A very recent, within memory of some, conclusion that the continents do not drift was proven wrong once the tech became available to show that, in fact, they do. Dr. Wegener was ridiculed for his findings when presented, but as we all now know, he was correct, the consensus was wrong. The divergence/pause problem is a real one in regards to the presented climate models of today. The error range of TOA measurements indicate that the perceived energy imbalance is not nearly as large as some would promote. One thing of certainty, the earth is responding in a very positive means. Vegetation has not been this healthy, food production not this large in centuries. Man kind is benefitting greatly. Sigurdur that’s an utterly ridiculous claim. A) Since Wegener was not able to come up with a plausible mechanism, it was proper for the scientific community to reject his hypothesis pending further data. B) He was ridiculed by an number of geologists for being a meteorologist and supposedly out of his depth – but that’s how human enterprise goes, a lot of back bitting. It doesn’t change the fact of Wegener’s lack of solid evidence. C) Wegener’s continental drift ideas remained alive and inspired subsequent scientists to discover and collect the missing data needed to make an overwhelming case with the power to overturn established consensus. AS THEY DID and AS IT WAS. You seem to think climate models are supposed to accurately mimic our weather. Climate models are tools to help develop our understanding! Expecting perfect replication of weather patterns is an act of Willful Ignorance and disregard for the models roll in scientific study. What pause are you talking about? Have you no conception of what’s been happening at the north and south poles??? WHERE IS THIS PAUSE EVIDENT? Please answer that. Or do you think this climate transition is all supposed to play out along the timescale of quarterly profit reports? Love your little “Food production has not been this healthy in centuries” stop fixating on the Rear View Mirror. It’s the past decade and future you should be thinking about. Sigurdur , your Republican/Libertarian fabricated arguments demand a total rejection of rational evidence assessment and learning – shame on you! Willard asks: What search terms would you use, Shub, and which operational definition of relevance do you have in mind? As to relevance anything that Richard’s gremlins let through. The question that should be asked is: How have the authors tested the suitability of abstracts retrieved by their chosen keywords for the purpose of determining ‘consensus’? If so, what method did they use? The answer is: they did not test this. while appearing intuitive, does not fetch relevant papers from Web of Science. Researchers assign tags to their papers. Would “Anthropogenic Global Warming” been more suitable? What other terms would you suggest? Why do you believe that would have made a difference in the results of the study? ‘Global warming’ is a phrase used by workers in the climate impacts and mitigation fields. The term is colloquial and used in a non-technical sense. Researchers working on climate impacts assign this as keyword to their abstracts on the basis of their assessment of relevance to the topic of global warming. It is not reflective of their expertise or relevance in addressing questions of attribution. Additionally, what this captures is a bandwagon effect. Search for “global warming” in WoS with settings used by Cook et al yields 9,466 abstracts, i.e., ~77% of the total 12,332 returned when using both terms. In Cook’s data, 77% of abstracts (9166/11944) are from climate impacts and mitigation categories. The above shows the Cook et al author database is extremely likely constituted by a majority of academics whose expertise does not lie in climate physics, climate modeling or attribution methodology. Ari Jokimakki of Skepticalscience undertook an interesting method to verify the composition of retrieved abstracts. The results are available on their website. They agree with the above. I’m not finding the article at SkS by Ari that you refer to. Have a link? Beyond that I’m not figuring out what your point is about the study or more importantly it’s conclusion. It’s like fighting over loose change or spending an hour figuring the tip you’re going to leave for an expensive dinner. We have only so much time and energy available, that’s why I’m constantly flabbergasted at the amount of energy and time spent arguing about what seems like window dressing, all the while ignoring the substance of the information we are being given. Or the fact that Cook’s study is only one of many that have arrived at very similar conclusions. Shub I’m wondering if you could give an example of how you think they should have approached this. Is it other search terms they should have tested… how would you have done it … can you explain? The list of questions asked mentioned one about the respondents level of concern about catastrophic effects of climate change. But I couldn’t find that in the article itself. Anyone see what were the percentages of the responses to that question? However, I wasn’t able to find the question addressed in the article itself. Robert Clark, that’s correct. The answers to this Q and to many others were not included in this article. I would like to know what the breakdown of the responses on that question is. My point is the key point that should be addressed is not just whether humans caused most global warming but also whether it is expected to cause catastrophic effects on a relatively short time scale, say, less than 100 years. I’ll get back to that question in due time.
. . . whether it is expected to cause catastrophic effects on a relatively short time scale, say, less than 100 years. Considering that question, it seems to me like our society has gotten to be adept at forgetting the environmentally destructive trends of this past century. As for the potential for catastrophic effects, perhaps it’s time for someone to define exactly how catastrophic they want these effects to become before taking notice? I say this because it seems that these past years have brought genuine warming climate related catastrophes to many people, after all, every weather pattern these days is born within this warming climate system of ours! … and it’s guaranteed that weather trends will continuing destabilizing and having more energy and moisture to inject into our global heat distribution engine’s weather systems. What are we in for in the next decades, let alone century? And these are just some of the more obvious ones. How could such historic and unchecked trends not lead to a series of unprecedented catastrophes? Oh boy, what a story to I bump into after posting the above. While I hear others talk about centuries, it sure seems to me we are talking decades and damned am I glad I’m about to turn 60 rather than 16… and oh what a hideous indictment of my generations. We’ve know since the 60/70s what we were playing with. By the 80/90s we had the evidence. Here we are 2014 and nothing of substance has happened except exponentially rising consumption and rampant biosphere pollution and destruction and calls for more study. I don’t see how any new fresh study can tell us anything significantly new, but another new study will be called for so we can be absolutely positively certain yet again that it can be worse than the previous study warned us. And they call me the fool, lordie lord. Please keep comments on this post on-topic, i.e. related to this survey. There’s an open thread for other climate related discussions. citizens, The answer would concern issues with Cook et al, which is not the topic of discussion here. Briefly however, the answer is simple: while reading abstracts to survey the scientific literature seems an attractive thing to do, the exercise is fraught with methodological and sampling issues, some of which are insurmountable. The keyword question is elaborated above. Secondly abstract text, retrieved by whatever method, does not contain the kind of consensus information required for objective raters to carry out classification. Thirdly, rater biases impact classification. The best option would be to perform direct surveying (as scientists). Direct surveying requires sound sampling strategies as well. With lack of data, it is impossible to assess sampling for this paper. The Goat’s objections appear to invalidate our entire approach to pursuing scientific progress. Publications by themselves are useless; only personal, direct interviews with researchers are sufficiently reliable as to allow citation of past work as supporting material for new research. Unfortunately the Goat’s brilliant epiphany has thereby destroyed the notion of foundationalism, thus exposing us as knowing virtually nothing with reasonable confidence. For example, we cannot speak to Newton and obtain confirmation of his basic insights on the three laws of motion, thus our confidence in classical physics is misplaced, etc. This is a pretty embarrassing situation to say the least. On the face it of the Goat’s claim seems somewhat unreasonable. While you can criticize Cook et. al along some dimensions, The criticism that the large number of articles with no specific attribution invalidates it is silly. 1. Take a random collection of published articles in biology journals. 2. Count the number which actually dispute or affirm evolution. If this number is over 10% I’d be very surprised. If the number denying evolution is over .5% I’d be extremely surprised. 3. Now argue that since 90% of articles made no specific attribution, there is limited consensus among biologists over evolution. Your thought experiment only shows that those ambiguous papers will not prove a limited consensus. But since those papers provide no valuable information at all, they cannot be used to support it either. How is a study valid if the majority of your data is worthless? amatterofmarching jumps off the same cliff as Jose Duarte, not understanding what “consensus” means. A consensus does *not* mean that the majority of papers explicitly determine that the dominant theory is indeed correct. A consensus means that the majority of scientists consider it the most likely theory, and either explicitly or implicitly apply it to their work. Which directly explains why a lot of the papers that Duarte complains about are included in the count. If you look for papers on evolution, the vast majority don’t show how it works, but just apply it to their work, showing they accept it as the prime explanatory theory. The same goes for HIV causing AIDS; the theory of relativity; anthropogenic global warming. Marco, papers that provide no information one way or the other cannot be used to prove a consensus or a lack of consunsus. Anything beyond that is subjective, silence is not the same as agreement (or disagreement). It might have helped to actually read Duarte’s article. So what’s Duarte’s ax to grind? Or perhaps just another opportunist taking advantage of the hot new marketing niche ?? “Most of these studies use political activists as the raters, activists who desired a specific outcome for the studies (to report the highest consensus figure possible)”. The evidence he provides for the rates being political activists who desired a specific outcome is…drum roll…because he says so. He provides no evidence whatsoever for that claim. It gets worse, however. The paper clearly and openly acknowledges potential bias of the raters. They tested that potential bias by comparing with the author ratings. It probably was too inconvenient for Duarte that this showed the raters had been *conservative* in their ratings compared to what the authors said, so let’s not mention that, eh? His continuous cries of “fraud” are perhaps more telling about his own frame of mind than reality. cc, I think Duarte has become wedded to his beliefs that it’s not that conservatives are wrong, it’s that they are being discriminated against in academia. I personally believe that more than 50% of 20th-century warming can be attributed to anthropogenic forcing, but the controversy over this meaningless political statement is one of the stupidest in climate science. It is both meaningless and consistent with ethical science. Suppose exactly 50% of 20th-century warming could be attributed to anthropogenic forcing, leaving unforced variability (and perhaps solar and volcanos) as the explanation for the remaining 50%. Anthropogenic warming this low plus known anthropogenic forcing produces estimates of ECS and TCR between 0.6 and 1.0 degC! Yes, I’m 95% confident that ECS and TCR are greater than 0.6-1.0 degC. So what? These values won’t produce catastrophic climate change and certainly don’t justify emissions reductions. You need to blame ALL of 20th century warming on man and 150-200% of 20th-century warming on GHGs before the future looks catastrophic. The forcing from GHGs today is nearly equivalent to a doubling of CO2 right now. As Stephen Schneider points out, ethical science means including all of the if, ands, buts and caveats. What caveats should have been attached to the attribution statement? How about starting with: “If climate models accurately reproduce unforced variability in climate, then we conclude …” What evidence do we have that climate models show skill in reproducing unforced variability in climate. such as: ENSO (poor), AMO (negligible? ), the recent hiatus (poor), warm period around 1940 (none), hindcasting decadal variability (CMIP5, none), the LIA (poor), the MWP (none), orbital forcing producing and ending ice ages (none). “If climate models accurately reproduce unforced variability AND climate sensitivity, then we conclude …” Do climate models get ECS right? Most models have ECSs around 3 degC. The IPCC gives a 15-85% confidence interval of 1.5 to 4.5 degC for ECS. The confidence intervals for attribution statements based on GCMs are too narrow. Mostly agree with you, except with that “more than 50% can be attributed”; paleoclimate records make me think that that attribution is more likely just 0,1% due to land use. But the most important thing to me is your real scientific attitude, or should I say your not too common “common sense”? Please keep the discussion focused on the survey results.